Over the past couple of years, the SFMTA has made small but important streetscape changes to boost performance of the N-Judah. The N is San Francisco’s most well-used light rail line with over 40,000 daily riders, but the condition of certain surface street segments is less than ideal. Daily boardings at a few of the most popular surface stops compare favorably to N boardings at the downtown subway stations, but rather than waiting on a platform that meets the train, some riders are instead obliged to cope with narrow islands or sidewalks, and to step off the sidewalk and check for traffic before boarding or getting off of a train in the middle of the street. Efforts to improve these conditions focused first on the most crowded segment of the route, including the two surface stops on Duboce Avenue and the popular stop at Carl & Cole, which have been upgraded. In addition to replacing worn track, inadequate waiting areas were upgraded with sidewalk bulbs and expanded boarding islands. These are small but commonsense improvements that matter, and since they were built, these stops feel more like part of a modern light rail line than a legacy streetcar. LRV at the improved Duboce Park stop. Courtesy of SFMTA. The SFMTA is now planning additional upgrades further to the west in the Irving Street neighborhood commercial district, where there are any number of obstacles to the efficient movement of light rail vehicles. The core proposals for Irving are (1) bulbs that would serve as a “platform” to meet the train and (2) consolidating the two existing stops at 4th and 7th avenues into a single stop located on the block between 5th and 6th avenues, as well as relocating the stop corners at 9th Avenue so that trains stop at the far side of the traffic light rather than the near side. The sidewalks along Irving and 9th Avenue, which feel too narrow even to properly support the commerce of the street, double as transit waiting areas and can become quite congested. About 2,500 riders board the N each day at the 4th, 7th and 9th avenue stops, and the proposed transit bulbs would provide a safe and dignified area to board and alight as well as add some breathing room to the sidewalk. The project would also benefit people that ride the N through this area. The SFMTA estimated that about 3 minutes of travel time would be saved — through a combination of eliminating one stop, building two-car-length transit bulbs to reduce boarding time, signal improvements, and using bulbs to reduce opportunities for illegal parking. About 16,000 to 17,000 riders who pass through the project area each day on the N will appreciate the swifter trip. But as with any project in San Francisco that threatens to remove cherished parking, neighborhood interests have risen in opposition, this time seizing the loss of one N stop as an opportunity to frame the argument as concern for the plight of elderly and disabled and thus mask the real issue at hand — the loss of 30 on-street parking spots to the two-car-length transit bulbs. The SFMTA quickly capitulated and offered a revised proposal (PDF) with transit bulbs that are only one car long. With this revision, only half the train would be accessible from the improved boarding area, and the travel time reduction benefits would similarly be cut in half. But what a relief for the neighborhood — only 14 parking spots would be removed. The SFMTA conducted a survey (PDF) on the original proposal with two-car-length transit bulbs, as well as an alternative that halves the bulb length. It is encouraging to see how much local support there is for transit-preferential street design. Two-thirds of survey respondents strongly or somewhat liked consolidating the 4th and 7th avenue stops, and 51% strongly or somewhat liked a full-length transit bulb at that consolidated stop (vs. 41% strongly or somewhat disliking the full-length transit bulb). At 9th Avenue, 61% of respondents strongly or somewhat liked relocating the stop corners and 60% of respondents strongly or somewhat liked a full-length transit bulb. Survey results on the 4th-7th avenue consolidated stop. Courtesy of SFMTA. For the changes proposed in the 4th-7th avenue segment, the survey asked respondents to rate a full vs. half length transit bulb. Interestingly, cutting the bulb length in half dramatically reduced the number of strong supporters, from 39% to 16% strongly liking. There was also a noticeable but less dramatic reduction in overall supporters, from 51% to 45%. In contrast, the number of respondents that were dead set against the two-car bulb did not change significantly in response to cutting the bulb length in half, decreasing from 33% to 29% strongly disliking, and the overall opposition increased slightly from 41% to 42%. In short, cutting the transit bulbs in half significantly dampened enthusiasm for the proposal, but it did not dampen the opposition against it. We should be careful about reading too much into one survey conducted for one project, and we cannot be sure just from these results how individual opinions may have changed in response to the full vs. half length bulbs. That said, the overall sentiment is consistent with the tenor of dozens upon dozens of public meetings I’ve attended over the years. Watering down designs that rethink the existing allocation of street space generally won’t turn kvetchers into believers. Curmudgeons will, by and large, remain curmudgeonly. It seems to be the case on Irving, and it is certainly the case on Polk, where the “Save Polk Street” coalition plans to mobilize this Wednesday, March 26 to oppose even the compromise that the SFMTA offered to appease vociferous Middle Polk merchants. Instead, watering down designs makes the significant portion of the public that does support the SFMTA’s complete streets proposals ever more frustrated and disillusioned and — over time, as more such examples accumulate — erodes the public’s confidence in the agency’s ability to deliver even small projects with quality execution and within a reasonable timeline and budget. That, in turn, suggests that even when compromises are devised with the best of intentions – for example, to broaden support for transit revenue measures planned for the November 2014 ballot – compromise ultimately may be a losing strategy. C.W. Nevius, that fount of transportation wisdom, has declared outcomes that make everyone equally unhappy to be “perfect” — but do those outcomes improve the public’s perception and trust of the SFMTA? At least on Irving Street, the survey suggests that is not the case. Yielding to complaints about parking would apparently not help build a new supportive constituency in the Inner Sunset but instead would degrade the supportive constituency that already exists. Coming from the viewpoint of someone who does not own a car and relies on Muni daily, I support additional revenue measures for transit, provided there is some confidence that the enhanced revenues will be used to improve service and maintain infrastructure and rolling stock. Settling for half-baked measures that prioritize maintaining a sliver of public right-of-way for private vehicle storage does not inspire the confidence that will win my vote. In the case of Irving Street, it is particularly egregious that the SFMTA even feels pressure to compromise. In order to maintain a mere 16 parking spots for use by about 80 vehicles per day, the SFMTA is apparently willing to “throw under the LRV” more than 40,000 daily N riders, including approximately 20,000 riders that board in or ride through the project area. This is not to say that the diluted plan wouldn’t have some benefit. It would — but even for the original proposal, the tradeoff is tiny and well worth the benefits. It’s difficult to see how watering down a plan specifically to preserve a miniscule amount of on-street parking can be viewed as “transit-first,” and it’s quite frankly a travesty that civic discourse on this issue has degenerated to the point that a conversation about 14 vs. 30 lost parking spaces is entertained as one worth having. Public input, opposition included, is valuable when it is collected with an eye toward channeling local intelligence and making projects maximally useful for the populace they are intended to serve. But not every statement uttered at a public meeting is of equal merit and deserving of equal weight. When the facts are on its side, the SFMTA should use those facts to counter individual anecdotes and opinions, stand by its proposals and then implement them — preferably in a timeframe of months rather than years — to ensure, above all, that its stated objectives are actually met. For when all is said and done and the project is built, even the highest fever-pitch at a community meeting will become little more than a faint memory. But the results on the ground will endure. The biggest problem is that 9th & Irving is an incredibly busy intersection, at the core of a lively shopping district, the one ingress point into Golden Gate Park, and the odd double-bend of the N from Irving into 9th and then Judah. It would make more sense for me to move the 9th & Irving stop to 8th & Irving, and better yet, make the N turn into Judah earlier or way later. As for your perspective on parking, it can be easily turned around – even a compromise that entails a loss of 14 parking spots won’t make you happy, so why should car owners (who make up 54% of households in San Francisco county) compromise with intransigent transit advocates either? Seems to me that 2,500 riders > 100 people in cars. Why does math not matter? Although this poll is just based on one project, it matches my experiences from seeing other projects. Watering things down won’t help; only adding scope (even if it’s unrelated or not cost effective) can increase support for a project. The Altshuler and Luberoff Megaprojects book talks about this phenomenon from a political science perspective. In Public Choice theory, in a pluralistic environment like a city, many actors have the power to kill projects but few have the power to enact them without support from others. Projects that benefit the public at large, but no organized group in particular, simply don’t happen. Projects with at least some support get larded up to widen the basis of support. With the transit-vs-parking conflict there’s not much to be done… we’re not gonna drop new parking garages all over the city. 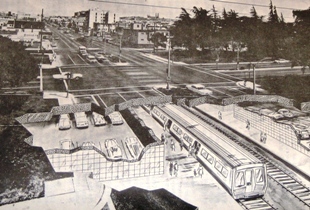 Though I would argue a large, hypothetical project like Geary subway /could/ include a parking garage element. Concerns from the San Francisco Fire Department that two-car length transit bulbs on both sides of Irving Street between 5th and 6th avenues would require SFFD personnel to operate equipment directly under the Muni’s overhead wires during emergency response. SFFD did not raise any objections to the proposed transit bulbs at 9th/Irving, but between 5th/6th they were concerned with the original proposals, which would have extended the sidewalks approximately 6-8’ past the current location of on-street parked vehicles. SFMTA worked with SFFD to revise the design of the bulbs between 5th/6th in response to these concerns. On the west side of 9th Avenue south of Irving Street, a shorter transit bulb allows the southbound 44 O’Shaughnessy stop to remain curbside and allow an N Judah train to pass – there was some concern that a longer transit bulb at this location could create a situation where a 44 bus stopped at the bulb would delay outbound N Judah trains by preventing them from being able to complete the turn through the 9th/Irving intersection. A shorter bulb at this location also allows one commercial loading zone to remain, and we heard from businesses on this block that this loading zone is heavily used for truck deliveries. On the south side of Irving Street between 8th and 9th avenues, the proposed inbound transit bulb was shifted toward 8th Avenue and shortened to provide more space for cars to queue behind a stopped train without blocking the intersection of 9th/Irving, which could potentially lead to cars blocking the busy crosswalk or outbound trains. Dustin, thank you for your considered comment. I will hazard a guess that you are Dustin White at the SFMTA who is working on the Irving Street project? In a busy, dense urban environment, there is always a give-and-take with limited space, and it’s usually possible to construct reasonable or reasonable-sounding arguments for and against almost any change one might make to that environment. Please know that I am aware of the considerations you describe but decided not to write them — in part for space reasons and in part because they are described elsewhere, but particularly the comments from the Fire Department. The Fire Department has previously blocked streetscape changes like bulbouts without giving a convincing explanation as to why a bulbout is worse than parked cars or any other obstacle that might be encountered on city streets. I also don’t really believe that the Fire Department’s comments are the crux of the issue. As with so many other projects (and this is in no way unique to San Francisco), things seem to come down to parking. This is evident just from a glance at the SFMTA’s documents, which constantly mention how much parking is lost here or there, as though that is the paramount concern. It shouldn’t be, particularly not for so small a parking loss — not if San Francisco really is to be a transit-first city. It is also evident from projects in other parts of the city, like Polk Street, in which the SFMTA’s original good ideas become diluted over time to preserve parking. I think the issue can be framed in simple terms: if we were building this line from scratch, we wouldn’t build platforms that are only half as long as the train. If we’re going through the trouble and expense of reconstructing the street, it should be done right. It’s worth underscoring how unscientific and biased these surveys are–a small respondent size and nonrandom sample means that this is going to be heavily skewed toward the loudest, most passionate voices (the pro-parking crowd). A randomized sample and/or a much, much larger survey is necessary in order to make any conclusions. Has anybody at MTA ever taken a basic statistics class? Facts and statistics have little or nothing to do with decision making at the SFMTA. For proof we need look no know further than how Dustin White’s has gone so far as to posting a whiny comment full of excuses and idiotic rationalizations why 16 parking spaces are more important to the SFMTA than the 40,000 N-Judah. We should all be outraged and offended the SFMTA is throwing out the Transit Effectiveness Project, though it shouldn’t be any surprise when even the agency’s own planning staff is posting to blog comments with excuses to justify why he cares more about less than 20 parking spaces over 40,000 N-Judah riders and 120,000 other Muni Metro riders effected by N-Judah delays and bunching. SFMTA didn’t just loose my voted with half-baked, anti-transit Muni improvement projects, it turned me into an enemy with its plan to triple Muni fares to $6 dollars to pay for free parking. I’ll be out campaigning against giving the SFMTA any more money it will just squander on parking. Ideally a defeat will teach the SFMTA, and its parking obsessed planners like Dustin, a lesson that forsaking the City’s transit first policy and hundreds of thousands of Muni riders to appeal to car owners with parking isn’t a good strategy.